Architect designed artist/ collectors home and gallery, deceptively large, bright and filled with beautiful objet d'art. Manhattan meets Paris meets Centennial Park. A beautiful combination of light filled bright interiors, designer furnishings, and beautiful artwork awaits you in this gorgeous architect designed home. Wonderful spaces connected by a vaulted corridor, an abundance of art, sky lights, wonderful use of mirror and a beautiful garden contribute to the wonderful feel of this single level home. The house has two air-conditioned bedrooms (one with a queen bed, one with a double bed) and two full bathrooms, one of which will take your breath away, The design was based on Parisian bathrooms and it's just beautiful! The living areas include a combined lounge room with TV and a sitting room. Through the vaulted corridor to the large eat in kitchen with bi-fold doors opening up to the long water feature and garden. Off the kitchen is the walk in pantry area and the laundry with a washing machine and a small additional freezer. There is an apartment on the first floor of this house. Access to the apartment is through the back gate and through the garden. The tenants upstairs are very quiet and keep to themselves. They may be away for some of the time. Located directly opposite Centennial Park, with it 189 hectares of wetlands, ornamental ponds, opine and native forests to explore by foot or bike, it's an easy walk into Bondi Junction with huge shopping centre, cinemas, restaurants, and major transport services, and the Woollahra/ Queen Street shops and cafes too. About 10 mins by car and you'll be at Bondi, Tamarama or Bronte Beaches. 5 night MINIMUM BOOKING FOR BOTH CHRISTMAS AND NEW YEARS EVE. as prices will vary depending on number of guests, length of stay and time of year. 10 night minimum stay for both holidays. A short history of Centennial Park Centennial Park has a distinctive and special place in Australian history and culture. It was once a huge catchment of creeks, swamps, springs, sand dunes and ponds fed by ground water, and was traditionally home to the Gadi people. In 1811, Governor Lachlan Macquarie designated the area as the second Sydney Common and it was used for grazing, lime burning and timber clearing. In 1825, convict labour was used to build a 3.5 km underground aqueduct, known as Busbys Bore, from the swamps to Hyde Park. This bore supplied Sydney’s main water supply from 1837 to 1859. In 1888, Sir Henry Parkes dedicated Centennial Park as a public open space for the enjoyment of the people of NSW. Hundreds of unemployed men were enlisted to turn swamps, scrub and rock into a grand park in the Victorian tradition with formal gardens, ponds, statues and wide avenues for Sydneysiders to drive their carriages around to ‘take the air’. 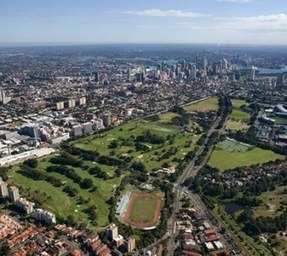 On 1 January 1901, Centennial Park became the focus of the nation as the site of the inauguration of Australian Federation (this event is commemorated today by the Federation Pavilion). More than 100 years later, Centennial Park remains a people’s park – a beautiful recreation area in the middle of Sydney’s densely populated eastern suburbs. It is also home to diverse flora and fauna and many significant tree plantings, including spectacular Port Jackson figs, Holm oaks and Norfolk Island pines dating back to the early 20th century. Today Centennial Park is a playground for adults and children of all ages and is one of the few inner city parks in the world to offer horse riding facilities. Use the options on the left hand navigation panel to find out more about Centennial Park and its features.